In an effort to have more variety in my dinner menu I have not only been trying to alter days of chicken, beef, vegetarian, pasta meals etc. I have been trying to vary the types of cuisine we eat. If you get stuck in an Italian seasoning mode you end up eating too much pasta and red sauce. If you get stuck in a Mexican meal plan you will probably end up eating way too much cheese. Mexican/Southwest, Italian, French, Indian/SouthEast Asian, Cajun etc... so now when I pin an ethic dish I put it with it's type of cuisine. For instance, if we feel like Asian one night, I have a selection of recipes to choose from. I have also made seasonal boards. When I find a great fresh produce item at the green market I usually have pinned a few dishes I can use it with so it doesn't wilt away in the bottom of my fridge while I try to figure out what to do with it. Take a look at my pin boards to get some ideas on how you would like to organize your recipe pinning for more interesting dinner planning, and please by all means follow me on Pinterest too. 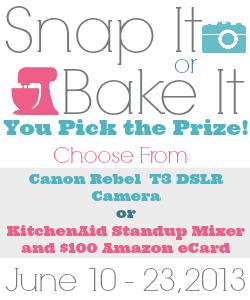 Remember to check out this fabulous giveaway I am involved with... great for yourself or wedding gifts. In my family that would mean eating mac n cheese every night. I am horrible about pinterest :) It looks like I need to start using it more, your boards look great! Thanks Ann they are a work in progress. There is really so much potential use for pinterest. That is a great idea! I've been needing to reorganize my food board, since it's two pages long now. So funny.. everything eventually needs to be reorganized. I have one board for recipes I want to try for the meal plan because I was losing track of the other recipes in the other boards. ACK! I wish there was a way to highlight stuff on Pinterest. I love the comment feature. I use that to mark when I'm making a recipe so I know that I've tried it. Thanks for sharing your tip at Motivation Monday! You should suggest highlighting to Pinterest. I think that would be a nice feature.